The title for my sermon today is “The Circle of Life” I chose this title because it popped into my head when I first contemplated preaching about the Advent Wreath. As I looked at the wreath, I thought about its five components-hope, peace, love, joy, and Christ- each a part in the circle of my own life. Collins on-line dictionary defines this phrase as-“Nature's way of taking and giving back life to earth. It symbolizes the universe being sacred and divine. It represents the infinite nature of energy, meaning if something dies, it gives new life to another.” For the Christian, we can think of the Circle of Life as God’s way of taking and giving back to earth, and of God’s energy, of new life, and eternal life. I clearly remember the first time I felt I truly experienced the circle of life. It was January 1996. Paula’s mother, Dorothy was dying from cancer. At the same time, we were preparing to adopt our son Sam, who was due to come into our world at any moment. We went through the difficult experience of life ending and beginning all at the same time. Dorothy died on January 8th. We had two days to plan her memorial service, and we said goodbye to her on January 10th. At the same time, we were waiting for the phone call to tell us that our adopted son Sam was on the way. On the same day we said our goodbyes to Dorothy, January 10, we held a newborn baby in our arms. It was a profound, amazing experience of the circle of life for us. Well, we have the circle of life before us here today- The Advent Wreath- This wreath symbolizes the circle of the life of Jesus. We use it during Advent to prepare for his birth, and to remember four solid principles that Jesus provides us – Hope, peace, joy, and love – And in lighting the Christ Candle on December 24, we are reminded that the story of Christ does not end with his miraculous birth. Jesus’ story comes to its fullness in his death and resurrection, which brings us new life, and life eternal. This too is a profound circle of life - of birth, death and new life all together. So then, let us look at these four principle parts of the Christian life, and see how it is that Jesus Christ is our hope, our peace, our joy, and our love. Let’s begin with hope. How do we define hope? The American Heritage Dictionary defines hope as follows: “to desire something with some confidence of fulfillment.” Rather clunky. What is hope? What does it mean for us to have hope in something? There are some things I have hope in: I hope my kids do well in life. I hope someday we will have more affordable housing in Ashland and throughout the Rogue Valley, so the working poor can find places to call home. I hope for an end to war. I hope that one day, children will not die from hunger. I hope that some people every year will get beyond the tinsel and glitter of the shopping season, and find the true meaning of Christmas in the birth of the Messiah. These are some of the things I hope for. I hope. I’m pretty confident all of all those things I hope for will happen someday, through the power of Christ. It means deep down, despite all of the darkness I see and encounter, I feel hopeful about people, about this world, and about the potential for good. But my feelings about hope don’t really define it any better. Perhaps someone has written a clearer definition for hope than the dictionary or my sentimental ramblings? Well, 19th-century American novelist, Herman Melville wrote, “Hope is the struggle of the soul, breaking loose from what is perishable, and attesting her eternity.” Now that statement has some depth to it. Rev. Dr. Martin Luther King Jr. wrote, “We must accept finite disappointment, but we must never lose infinite hope.” I remember hearing an old African American preacher many years ago preach about “stubborn hope”-hope that, no matter what happens to us in this life, cannot die. Now we have a framework to consider this question – How is Jesus our infinite, stubborn hope? How does Jesus provide hope for our souls when they struggle? How does Jesus attest to eternal hope? How does Jesus point beyond the finite, that which we see here and now to the infinite? That brings us to today’s first passage in Hebrews- Hebrews is a fascinating book, in that it is the only book which speaks of Jesus as our high priest in heaven, intervening upon our behalf to God. The passage begins talking about us- the heirs of the promise of God. And Jesus himself is that promise. We heirs of Christ, who have fled for refuge from sin, from darkness, and from the difficulties of this life have a sure and steadfast anchor of the soul. Now the author of Hebrews likens Jesus to the order of Melchizidek. What on earth does that mean? Melchizedek was a King of Salem and priest of God who blessed Abram in Genesis chapter 14. His blessing and his name are significant. He blessed Abram, who would become Abraham and become a blessing unto the nations. The name Melchizedek means “King of Righteousness and peace”. For the author of Hebrews, Jesus, God’s promise, who is the high priest in heaven for us all, is also our King of righteousness and peace. We have hope, a stubborn hope that believes in this high priest of heaven, the King of righteousness and peace. He is the Son of God, who whispers to God upon our behalf, who guides us with his presence and his teachings, who makes us righteous before God in forgiving our sins through his sacrifice, whose Spirit is at work in the world bringing hope into hopeless situations, and who broke the bonds of death in his resurrection from the grave. Through Jesus, we have a stubborn, endless hope that cannot be eradicated. It is a hope that God is for us, and for all of humanity. It is a hope that God is working through Christ and through us to bring hope to the hopeless. How then is Christ our peace? Let us begin with a definition of peace. The American Heritage dictionary defines peace as, “the absence of war or other hostilities.” Again rather dry. The 5th meaning, however, says, “Calm, serenity; as in peace of mind.” A little better. Can you think of your most peaceful moment- a time when you felt a deep peace, calmness, serenity? I have experienced peace in a number of ways – peace late at night when the dishes are done, the kids are in bed, the television is off, and I can hear the sound of rain on the roof. That is peaceful. I experience deep peace after a time of praying and silence. I feel peace hiking trails like Bandersnatch or the Ditch trail, standing on top of one of the peaks and taking in the view. There are times when it feels as if the world stops, my heart slows down, and a smile creeps across my face. Those are moments of peace, and especially during this time of year, I crave those moments. When the great big commercial juggernaut of Christmas comes rolling in, peace seems far away. Our schedules get crammed with extra get-togethers, extended family visits, buying, wrapping and sending presents. Radio stations begin playing Christmas music the day after Thanksgiving, promoting Santa, sleigh bells ringing, dreams of white Christmases and Rudolph. The message of peace on earth, goodwill towards all gets buried in an avalanche of commercialism and secularism. I read a column in the paper recently by Martha Dowd, a columnist for the New York Times. She spoke about how much she hated Christmas – with all the decorating, shelling out money to buy presents for family members, and seeing “It’s a Wonderful Life” over and over again on television. It was enough, she said, to make her “want to tear the face off Frosty the Snowman.” I don’t blame her. If that’s all Christmas was to me, I don’t think I’d be too excited about this time of year either. Yet there is so much more to Christmas than that. There can be, for all of us, access to a deep and lasting peace- for the Prince of Peace has come to us. The Prince of Peace has walked this earth, and offered us a new way to live. This peace begins when we tap into the realm of the Prince of Peace, when we quiet our minds, slow our hearts, and listen to the divine wind that is always blowing. There are so many who are caught up in the winds of business, that they cannot hear the small still voice calling us to peace. They choose to turn away from the Prince of Peace, absorbed in adrenaline, conflict, and hype and believe peace to be nothing more than an absurd pie in the sky non-reality. Yet peace rules the day when Christ rules the mind. Rev. Billy Graham said, “Peace is not arbitrary. It must be based upon definite facts. God has all the facts on God’s side; the world does not. Therefore God, and not the world, can give true peace.” Rev. Graham’s words echo Jesus’ words in John 14:27. 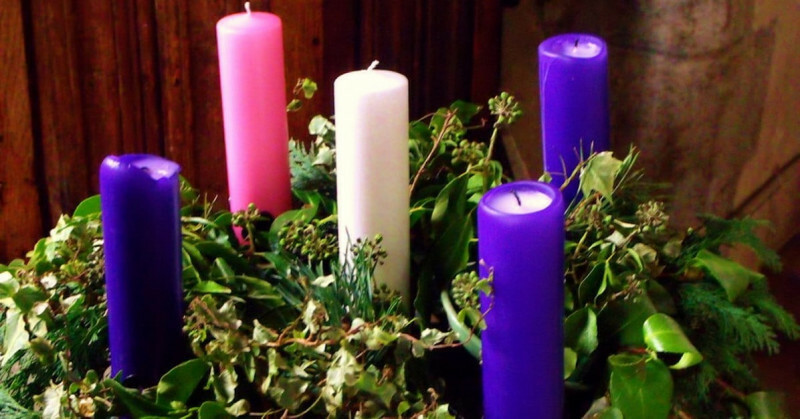 The third and fourth Advent candles, representing joy and love, are interrelated. Perhaps that is why I often get them mixed up! John 15:9-11 establishes that joy comes from love- not just any kind of love, but agape love. This is an unconditional, never-ending love, which has its source in God. That love has been fully expressed for us in Jesus’ own sacrifice. “For God so loved the world, that God gave us the only son, that whosoever believes in Him may not perish, but have eternal life.”(John 3:16) Jesus expressed that agape love in showing love for the outcast and the enemy- the Samaritan woman, the leper, the tax collector. He expressed that agape love in his acceptance of children, of women, in healing the sick, the possessed, and the infirm. This same Jesus called us to agape love God, neighbor and ourselves. (Mark 12:30-31). In today’s third passage, Jesus calls us to abide in to live in this agape love, and if we do so, Christ’s joy will be in us and become our joy, filled to the rim. So we receive joy from Jesus when we live in agape love. The kind of joy Jesus gives us, this calm, happiness, knowing that ultimately when we “Happiness depends upon what happens; true joy does not. ”I fought the idea of having a plastic, joyful fake looking smile upon my face at camp. I thought that was a hollow joy at best. Theologian Oswald Chambers said, are well off comes when we begin each relationship, each interaction with love. It remains present when we realize that we are never alone, for the Spirit of Christ is present with us, guiding us in every situation. This xaira joy sustains us when we remember, “The sufferings of this present time are worth nothing compared to the glory that will one day be revealed in eternity to us.”(Romans 8:18) That is the kind of joy Christ gives us. So give thanks this day for our Advent wreath, The Circle of life that stands before us today-for the hope, peace, joy, and love Christ brings us. Alleluia! Amen.